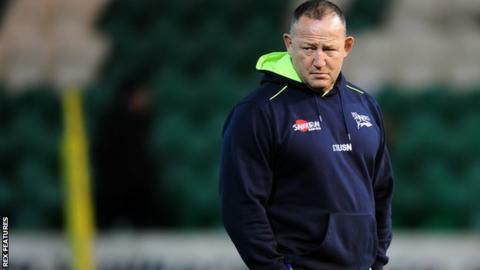 Sale Sharks director of rugby Steve Diamond has been given a six-week touchline ban by the Rugby Football Union after pleading guilty to verbally abusing match officials. The incident came after the Anglo-Welsh Cup game with Harlequins on 3 February. The 49-year-old will serve three weeks of the suspension immediately, with the remaining three weeks suspended until the end of the 2018-19 season. He was also fined £3,000, half of which is suspended until 2019. Both suspended elements of Diamond's punishment would be activated in the event of another similar offence. An RFU disciplinary panel statement said: "The panel deprecates any abuse of match officials regardless of the circumstances. "Such behaviour is contrary to the spirit of rugby and the core values of the game and will be treated seriously by disciplinary panels." Diamond's ban prohibits him from entering the playing enclosure or technical area, plus approaching or talking to any match officials.